USA Hockey’s National Team Development Program enters the weekend with a combined record of 55-33-5-5 (W-L-OTL-SOL) overall and a combined record of 26-18-2-5 in USHL play. 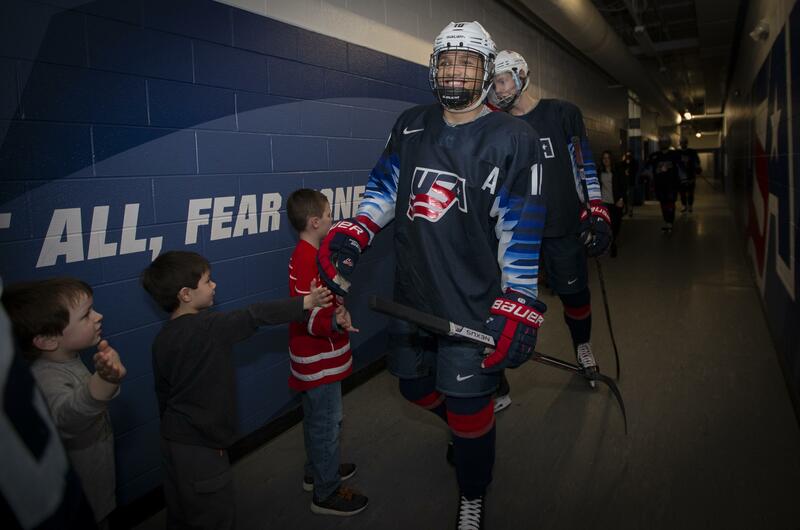 The U.S. National Under-18 Team hosts the Des Moines Buccaneers at USA Hockey Arena on Friday (Mar. 22) and Saturday (Mar. 23) at 7:00 p.m. 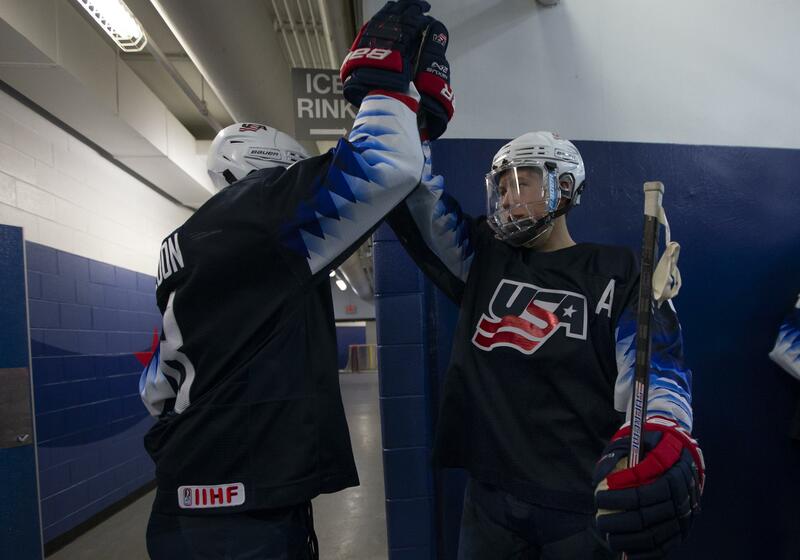 ET, while the U.S. National Under-17 Team takes a weekend off. The U.S. National Team defeated the Muskegon Lumberjacks, 7-3 behind a hat trick performance from Cole Caufield(Stevens Point, Wis.). Caufield opened the scoring for the U17s at 5:03 of the first period on the breakaway. He sent the puck over the glove of Muskegon’s Keegan Karki after collecting a pass from Alex Turcotte (Island Lake, Ill.) at the blue line. Ryder Rolston (Birmingham, Mich.) netted his fourth goal in his last three games at the 19:30 mark of the first to give the U17s the lead heading into the first intermission. Alex Vlasic (Wilmette, Ill.) skated the puck into the zone before sending it over to Rolston who shot it in from the right circle. Muskegon netted two quick goals in the second to take the 3-2 lead. Michael Gildon (Plano, Texas) tied the game at three at 9:37 of the second period lifting the puck on the backhand. Trevor Zegras (Bedford, N.Y.) regained the lead for the U17s at 10:03 of the middle frame. Marshall Warren (Laurel Hollow, N.Y.) sent the puck to Zegras at the top of the left circle who then wristed it beyond Karki on the power play.Ryan Siedem (Madison, N.J.) also picked up an assist on the goal. A giveaway by Muskegon in the slot resulted in Caufield’s second goal of the game at 4:44 of the third period. Caufield competed the hat trick at 6:51 of the final frame with help from Matthew Boldy (Millis, Mass.) and Henry Thrun (Southborough, Mass,). Boldy picked up his second point of the afternoon and gave the U17s the 7-3 lead at the 13:21 mark of the third period. Muskegon added two goals at 17:11 and 18:30 of the third before John Beecher (Elmira, N.Y.) sealed the 8-5 win with the empty-netter. Boldy tallied his third point of the day with the lone assist. Both Spencer Knight (Darien, Conn.) and Muskegon’s Karki tallied 21 saves. With the U17s win and the U18s win on the road, Team USA currently sits in first place of the Eastern Conference with 35 points. The U17s are back in action Saturday (Jan. 20) when the Sioux Falls Stampede come to USA Hockey Arena for Star Wars Night. Tickets are available at USAHockeyNTDP.com/Tix.